This breed of dogs are present in three types the first one is Standard then Miniature and the last one is the Toy. The first one Standard is a first breed of this dog. This dog breed basically was known as a water dog, this dogs was liked by royals and other high class aristocratic families. 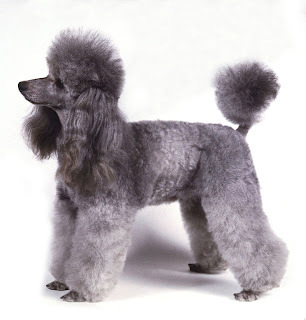 The poodle is one of the most energetic and athletic breeds of dogs, they are quit by nature and are good with children and older people, they are very sensitive and intelligent. They maintain their dignity through their nature and different qualities which they have and for which they are known. They are very famous through out the world, The Poodle are loyal and highly devoted to their family and owner. Because of their caring nature they are easily attached with any one member of family and are very sensitive regarding their family moods.The standard and miniature are most amiable pets, in poodle the standard does well with children and older people where as miniature and toy are best for apartments and do well with family. The poodle is a good watchdog and is alert with strangers and any unknown voice they can be good protectors. They have a single coat which is hard and tough, it can be curly or corded, the colors of coat are generally in dark shades. This breed of dog requires early age socialization and obedience training. They are good learners but will not respond to any harsh and tough methods of training. Training must be given to the poodle dog breed with patience and fairness. They enjoy swimming and love to spend time with family, they need regular exercise to be fit. Bathing should be done when it is necessary, brushing should be done to avoid dead hair and dirt stuck in the coat. It is important to clean their ear and teeth on regular basis to prevent teeth loss. This breed is prone to cataracts, PRA, allergies, skin disorders, diabetes, epilepsy, and heart disease.